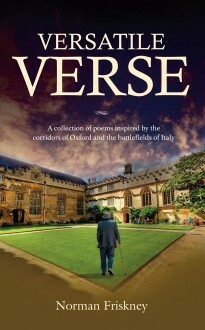 Versatile Verse is a collection of the author’s poems written over many years, in many cases for family and friends. The verses reflect the author’s varied life, lived out most notably in the halls of Oxford University and the battlefields of Italy, where he served as a young officer during World War II. Moving, insightful and often amusing, they have entertained many, and through this book are now available to a wider audience. A number of the poems reflect matters of contemporary concern, while others are concerned with insight into the human condition.